The air is crisp, the mornings require extra large mugs of hot coffee and the summer harvest list is dwindling by the day. We’re holding onto the final bit of summer by a shoestring and trying to enjoy every last bite of the season’s bounty. The Tumbleweed Farm barn is stocked to the brim with winter squash and potatoes however, we’re not quite ready to dive in. We still have some tomatoes and zucchini to eat before we finally throw our hands up and “officially” transition into the Fall harvest. 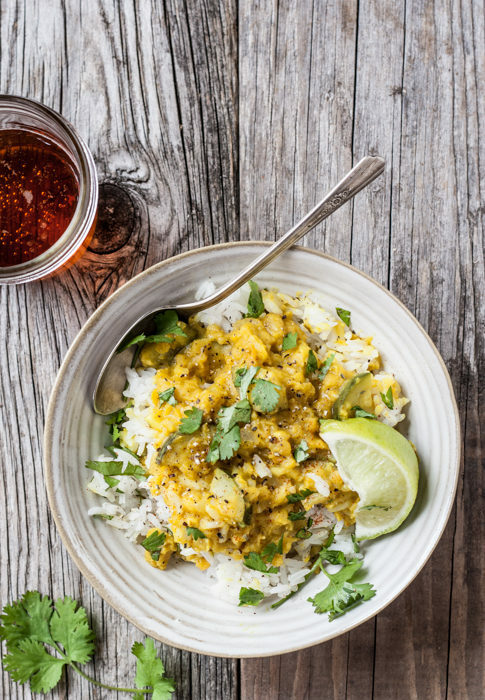 This simple zucchini curry is a breeze to whip up and is the prefect “in-between” the seasons dish to serve on a chilly evening. We enjoyed this meal with a couple of rad friends (Kate, Brett and Tino you know who you are!) and some tasty beers to complete the meal. If the weather calls for a big bowl of hearty stew, good company and a couple of tasty beverages then you’ve come to the right place. Grab your wooden spoon, pour yourself a beer and call your best buddies over for dinner. Cheers to the end of summer harvest! Mmmm…cannot wait. Love me a good curry! This was delicious! I used green lentils since I had those on hand and added hot sauce and more spices to dial up the heat. The lime garnish is divine. Yum! Passed the husband test. This is going in the rotation! Celebrated another rainy day by using my last couple of zukes in this. What a delicious lunch! My husband gave it the thumbs up, and he hates zukes! Spiced it up a little more, easy to do. Made this for dinner tonight. Delicious! My son gave it a big thumbs up, he was intrigued to hear where I got the recipe from. He has just purchased 17 acres here in Connecticut with plans to manage it for organic farming. He just moved back from several years in Oregon working on organic farms and as an arborist. Cooked this lots last year and everyone loved it. Courgettes are taking over the garden again so we’re looking forward to eating this again. It’s a really tasty meal and the lime makes it sing. Thanks for such a brilliant recipe. made it using up zucchini, jalapenos and onions from the garden – LOVED IT. I used almost two jalapeno for half the amount of curry and it wasn’t that spicy at all, my toddler ate it! I will definitely be making again – perhaps I will chuck in a few shrimp too, although it is delicious and filling without this.